Happy Monday! Did you miss me last week? I seem to just be ducking out willy nilly these days but this past week was our annual family beach vacation and although my intention is always to blog, I inevitably forget that the wifi at our beach house is essentially nonexistent. That was a really long sentence. 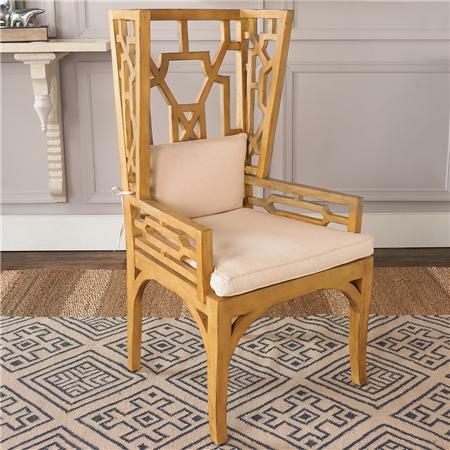 But I'm back with a bang in the form of this statement fretwork chair from Shades of Light. It comes in a set of two and that seat is just begging to be recovered in amazing fabric. Love the beautiful honey tone of the wood too. Two thumbs up! I have lots of adorable pictures to share from our vacation - will post them. Hope you had a great week! You have the best eye! welcome back, love the chair.